When it is time for your baby's bath time, you want only the very best. 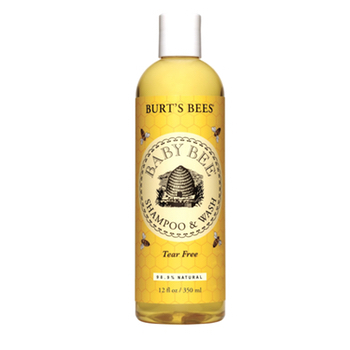 Burt's Bees Baby Bee Shampoo & Wash offers a tear-free, nonirritating formula to gently clean delicate skin and hair. Tested by pediatricians, the hypoallergenic Shampoo & Wash features moisturizing, plant-based ingredients such as aloe, oat flour, and soy proteins. It contains no phthalates, petrochemical, parabens, or synthetic fragrances, and it is safe and effective for everyday use. We've always loved the Burt's Bees products for everyday use, seeing as they use all natural ingredients. So when it comes to your little ones, you want to ensure. For a calm, tear-free bath time with your little one, Burt's Bees Baby Bee Shampoo & Wash offers a hypoallergenic formula that is gentle on your baby's skin and won't sting delicate eyes. It is pediatrician-tested, so it is suitable for young skin. Formulated with 99 percent natural ingredients, this shampoo and wash is ideal for daily use. Baby Bee Shampoo & Wash is made with natural, plant-based ingredients such as aloe, oat flour, and soy proteins, cleaning skin while nourishing and moisturizing at the same time. Your baby's hair will feel silky soft after each shampoo. During bath time, you can pour the versatile, creamy formula onto a wash cloth, directly into the bath, or straight onto your hand. You want the very best for your baby, especially in a product you use on a daily basis, so you can rest assured Burt's Bees Baby Bee Shampoo & Wash contains no sulfates, phthalates, petrochemicals, parabens, or synthetic fragrances, and it won't irritate your baby's delicate skin. Bath time is simple, natural and tear-free with Burt's Bees® Baby Bee® Shampoo and Wash. This natural baby shampoo gently cleans your baby's hair and body with soy proteins leaving your little one clean and smooth from head to tiny toe. Gentle on delicate skin, this 98.9% natural baby wash is pediatrician-tested and hypoallergenic with no sulfates, phthalates or parabens. After bath time, apply a Baby Bee® moisturizer to help keep delicate skin soft. Give your little one a natural start with Baby Bee® from Burt's Bees.